Bandit will steal your heart! This double cab, long bed Toyota Tacoma comfortably seats 4-5, sleeps 4+, and has plenty of space for extra gear. For those who venture off the beaten path, this sturdy platform includes V6 power, off-road ready all-terrain tires, high and low range 4WD, Auto-LSD differentials, off-road suspension, and skid plates. This Tacoma also comes with Toyota Safety Sense ™ which includes: Pre-Collision System with Pedestrian Detection, Lane Departure Alert with Sway Warning System, Automatic High Beams and Dynamic Radar Cruise Control. It also features Toyota’s Star Safety System™ which includes: Vehicle Stability Control (VSC), Traction Control (TRAC), Anti-lock Brake System (ABS) with Electronic Brake-force Distribution (EBD), Brake Assist and Smart Stop Technology®. Top Bunk: The Autohome Maggiolina rooftop tent is an adventurer’s dream. Extremely easy to set up and and pack up, you can be snug in bed in under 3 minutes. The 3.5” full size foam mattress can sleep 2 adults (and 1 small child) comfortably. Throw in LED lights, storage compartments and big windows for big views, and you’ll never want to come home! 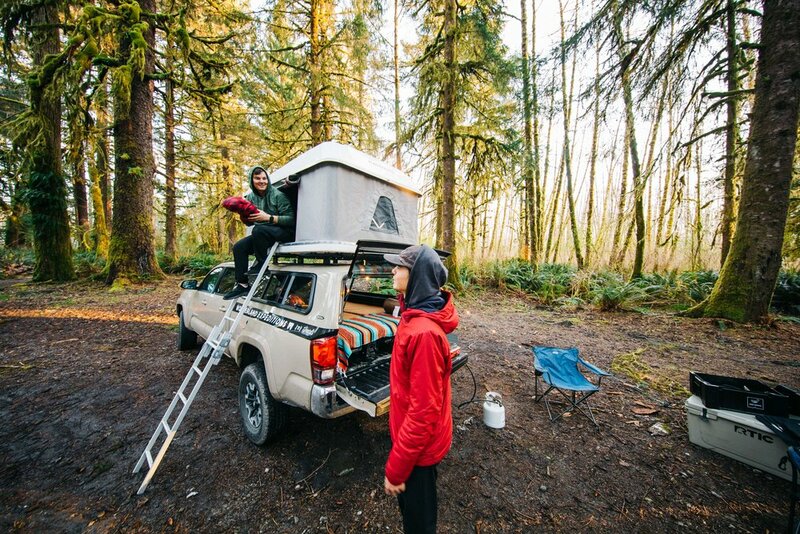 Bottom Bunk: In addition to the rooftop tent, this rig comes with a sleeping platform in the truck-bed, making this an efficient rig for camping with a family of 4 (or more)! The Decked platform in the truck-bed makes storing and accessing all necessary camping gear a breeze. The added full size mattress and pop-out windows make this a cozy camp set-up! El Burro is a sturdy, compact, and comfortable overlanding rig. This Toyota 4Runner comfortably seats 4-5. This easy to drive, compact platform is great for campers on the go. It is fitted with off-road ready all-terrain tires, 4WD (high and low range), skid plates, and Toyota’s Auto-LSD system, making it perfect for escaping deep into the backcountry. This 4Runner features Toyota’s Star Safety System™ which includes: Vehicle Stability Control (VSC), Traction Control (TRAC), Anti-lock Brake System (ABS) with Electronic Brake-force Distribution (EBD), Brake Assist and Smart Stop Technology®. The Autohome Columbus roof-top tent is an adventurer’s dream. Extremely easy to set up and and pack up, you can be snug in bed in under 3 minutes. The 3.5” full size foam mattress can sleep 2 adults. Throw in LED lights, storage compartments and big windows for big views, and you’ll never want to come home! As always, all necessary camp gear is included. Ground tent and sleeping pads can be added for additional campers.